This Sunday 11 May is Mother’s Day, the one day of the year that you can really show your mum how much you appreciate her. One of the loveliest things you can do is to treat your mum to high tea (with or without the kids!). Here’s a round-up of Mother’s Day high teas in Melbourne and surrounds. Over the years I’ve reviewed a lot of afternoon tea locations! Here are some of the HOT ones which are open for Mother’s Day. Langham Melbourne – one of my favourites in Melbourne for the quality of the food and the ambience. The closest to the ‘London afternoon tea’ experience I think, minus the all-you-can-eat ribbon sandwiches! Eclair Affair at Westin Melbourne – for the pastry lover, because everything other than the scones comes in choux pastry form. High Coffee at the Intercontinental – For coffee lovers rather than tea sippers. High Tea at Cinema Nova – watch a film and eat dessert! For Mother’s Day there will be special screening of Belle and Chef. Jam and Cream – this little cafe with a pink vintage caravan is as cute as it comes as a setting for afternoon tea. LuxBite – The Tea Set for Two gives you a little taste of the decadence available at this South Yarra dessert patisserie. Where a Girl Goes – Enjoy high tea in girly, pastel pink surrounds at this stationery and homewares store. Bursaria at Abbotsford Convent – High Tea in the lovely surrounds of Abbotsford Convent. You could even visit the Collingwood Children’s Farm next door! The Tea Salon – Do some shopping at Emporium then relax with a high tea accompanied by tea, sparkling or champagne. They have a children’s high tea too. 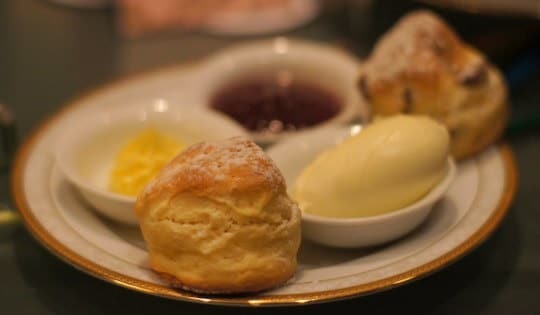 Collins Kitchen at Grand Hyatt Melbourne – Weekday high tea is a la carte, weekends has extended dessert buffet. High Coffee at The Waiting Room – The Waiting Room’s new High Coffee offering includes a selection of decadent sweets, sorbet, scones, sandwiches and hot savouries. The Hotel Windsor – Enjoy freshly baked scones are served with jam and cream and exquisite pastries sit above delicate finger sandwiches. A glass of French sparkling is served on arrival and an extensive selection of speciality teas and coffees are brought to your table throughout the afternoon. Plus an indulgent dessert buffet and chocolate fountain. Marriot Melbourne Hotel – Unlimited buffet of homemade scones, ribbon sandwiches, delicate pastries, sweet desserts, live crepe station, chocolate fountains, boutique teas, freshly brewed coffee and free-flowing sparkling wine for the duration of your seating. Sofitel Melbourne – Champagne and a buffet selection of freshly cooked crepes, elegant finger sandwiches, hot and cold savouries, freshly baked scones and a selection of cakes and desserts and tea or espresso coffee. Cost: $79 (morning seating only) or $89 per person, $45 for children aged 6 – 12 years, $25 for children aged 3 – 5 years. Hopetoun Tea Rooms – High tea in Melbourne’s historic Block Arcade tea rooms is available every day. Bookings: www.hopetountearooms.com.au/reservations 48 hours notice required. Wonderland Spiegeltent – delicious High Tea delights, unlimited freshly brewed coffee and divine tea, and for the naughty, 1 signature Fairy Floss Champagne on arrival. Children receive chocolate crackles, fairy bread, cupcakes as well as an Action Attraction Wristband so the kids can enjoy all of the great rides Wonderland Fun Park has to offer. Hotel Lindrum – Presented in a tiered stand, High Tea service at felt restaurant includes an assortment of ribbon sandwiches with smoked salmon, egg chai, tuna mayonnaise and cheese fillings. The sandwiches are served together with freshly baked scones with organic jam and clotted cream, petite pastries, macarons and afternoon cakes designed by Head Chef Raki Andriana. Stamford Plaza Hotel – Served on an elegant three-tiered stand, enjoy a seasonal assortment of savoury sandwiches, fluffy homemade scones with jam and cream, tantalising petit fours and sweet delights. 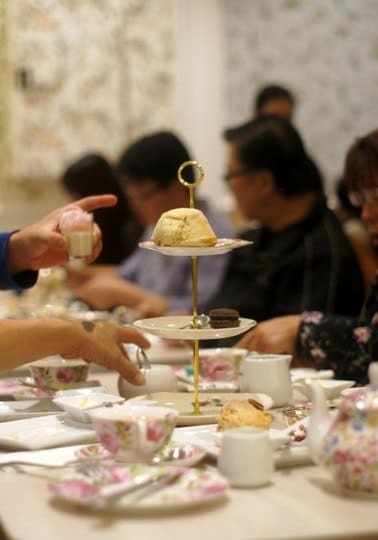 Myer Mural Hall – Elegant high tea in the beautifully restored and heritage-listed Myer Mural Hall. Be entertained by live music while you dine on a delicious sweet and savoury afternoon tea and a glass of sparkling on arrival. Mamor’s Chocolate – European High Teas are served in the Austro-Hungarian tradition of Vienna and Budapest and are offered every day. Full Chocolate Indulgence High Tea includes a nine-course repast with everything from savouries to sweets. Special requirements may be accommodated. Beau Monde International – Treat your mum to a decadent afternoon of savoury delights served to the table, delightful buffet of sweet treats and sparkling wine, tea and coffee. Includes a gift for mum and lucky door prizes. Mossgreen Tea Rooms – served upon a three-tiered silver stand and showcasing delightful Butterfly Bloom by Wedgwood fine bone china. The Vincent – Complimentary glass of Champagne on arrival, followed by a decadent 3-course high tea service. Indulge in a selection of dainty sandwiches, fluffy scones, macaroons, lemon tarts, mini cupcakes, chocolate éclairs. Win the ‘lucky tea cup’ prize – a pamper pack full of goodies. Popular jazz duo, Sweet Myrtle, will be performing live throughout the afternoon. Bookings: Call (03) 9682 6444 or click here to reserve your table. Ganache Chocolate – Enjoy the European ambience of the chocolate lounge, whilst Master Chocolatier Arno Backes and his team indulge you with a delightful array of savouries, scrumptious desserts and specialty chocolate creations. Cost: $45 per head or $60 per head with a glass of sparkling. Mother’s Day Tea at McCrae Homestead – Enjoy a Devonshire Tea in the garden at National Trust McCrae Homestead, and take a guided tour through one of Victoria’s oldest homesteads, the home of Andrew and Georgiana McCrae. Bookings: Online here, email the National Trust Bookings Office onbookings@nattrust.com.au or call the Bookings Department on 03 9656 9804. High Tea at Yarra Valley Lodge – high tea buffet with delicious delicate finger sandwiches, freshly baked scones accompanied by local homemade jam and fresh cream, savoury treats and sweet delights. Accompanied by a pot of freshly brewed tea of your choice. Price includes a complimentary glass of Yarra Valley sparkling wine.